This Stuffed Chicken Recipe is no ordinary stuffed chicken breast! 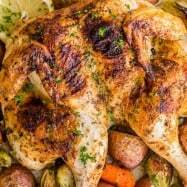 The first cut into the chicken produces a juicy burst of hot lemon-herb butter and makes the chicken so juicy and flavorful. This is the easy version of our classic Chicken Kiev (pounded, stuffed, rolled, fried and baked). This easy version has all the same great flavor with less effort = WINNING! Chicken Kiev is a luxurious dish for special occasions. It is an excellent recipe for company and our family is crazy about this stuffed chicken! Pro Tip: Salting the chicken just as soon as it is done cooking really amps up the flavor. 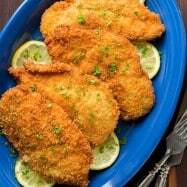 This is a great trick for breaded foods (we also used it on this pork schnitzel!). 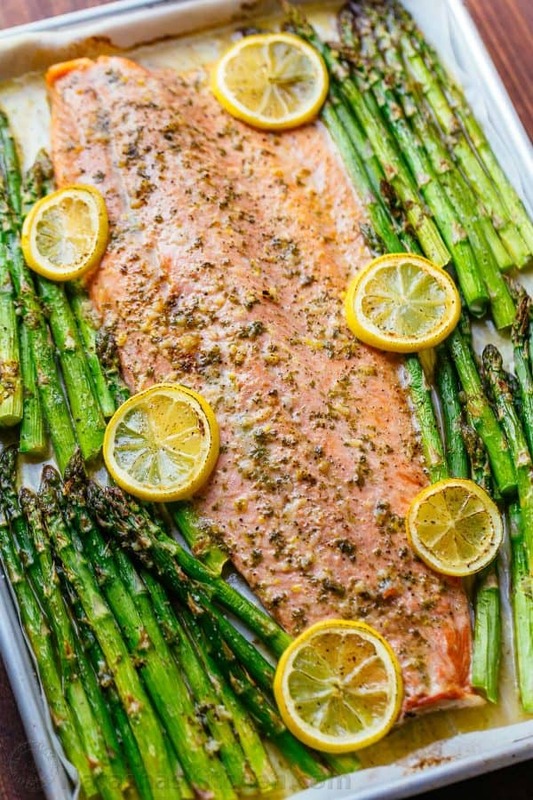 Garnishing with parsley and squeezing lemon juice over the top gives it a beautiful pop of fresh flavor and color. POLL: Does this next photo of the butter stuffed chicken make YOUR mouth water? P.S. We LOVE this Staub Braiser for frying foods (Amazon affiliate link) – it has tall walls and circulates heat evenly. It’s also coated cast iron so it’s easy to clean and maintain. You’ll see us use it in loads of our recipes! This Stuffed Chicken Recipe is no ordinary stuffed chicken breast! 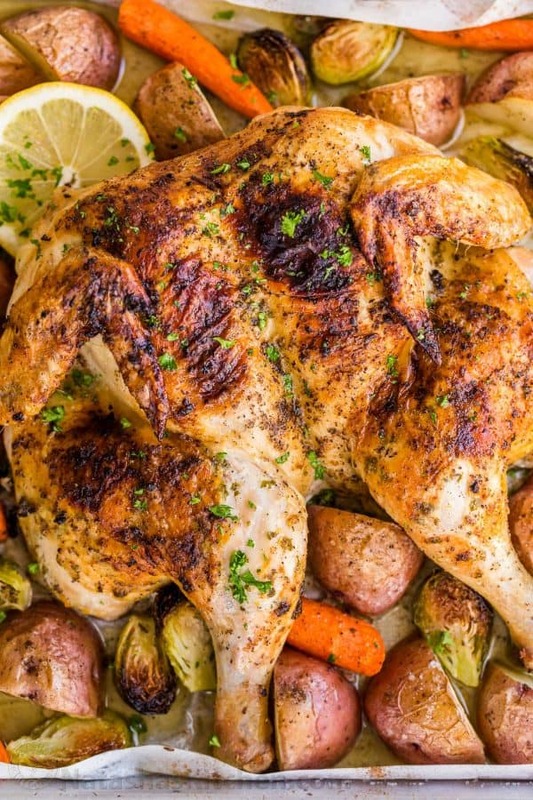 The first cut into the chicken produces a juicy burst of hot lemon-herb butter and makes the chicken so juicy and flavorful. The easy version of the classic Chicken Kiev. 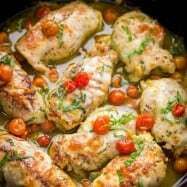 Excellent stuffed chicken recipes! In a medium bowl, combine all Lemon Garlic Butter ingredients and mash them together a fork. It takes about 2 minutes of mashing for the lemon juice to incorporate into the butter. Place 1 Tbsp of the butter filling into each chicken pocket then close to seal and push over the top of the chicken breast to disperse butter. Pinch the opening to seal then season both sides of stuffed chicken breasts with salt and pepper. Set up 3 plates for breading: In the first plate, pour 1/2 cup flour. In the second large bowl, beat together 2 eggs. 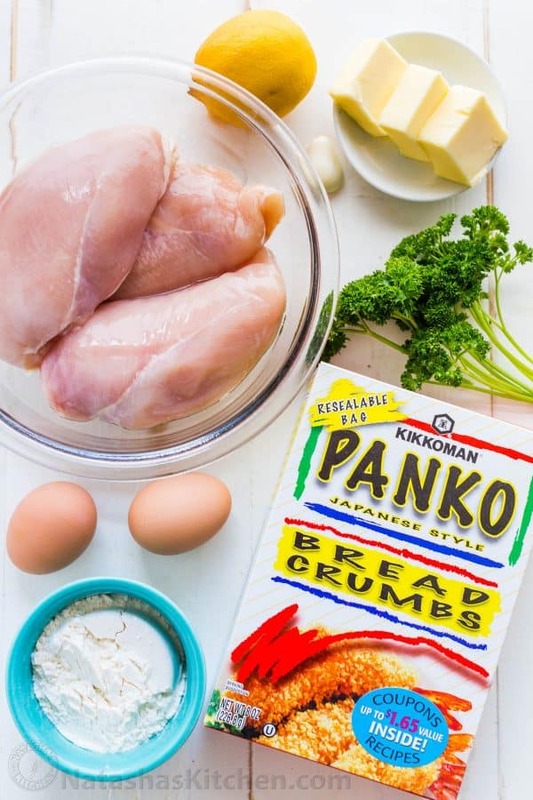 In the third large bowl, pour 2 cups panko crumbs. Dredge stuffed chicken in flour, shaking off excess then dip in beaten egg, allowing excess egg to drip back into the bowl. Finally, dip chicken into bread crumbs, turning to coat well. Transfer breaded chicken to a large platter or baking sheet. Heat a large, deep, heavy bottomed pan or dutch oven over medium heat and add 1/4" light olive oil. 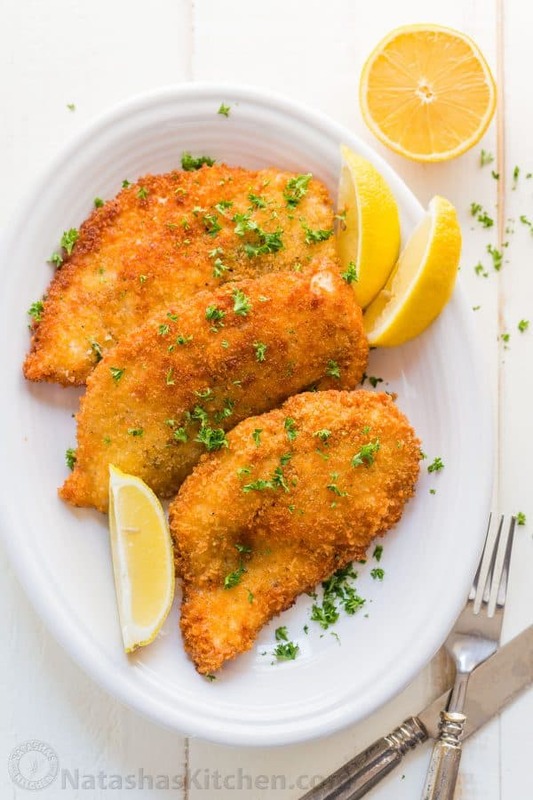 Once oil is hot (350˚F or sizzling when a bread crumb is added), place breaded chicken into the oil in 2 batches so chicken is not crowded and sautee 4 minutes per side, carefully turning with a spatula. ** Transfer cooked chicken to a paper towel lined plate. 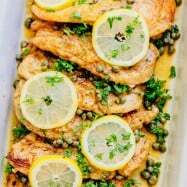 To serve: sprinkle lightly with salt if desired, garnish with fresh chopped parsley and serve with lemon wedges to squeeze fresh lemon juice over chicken. *Cook's Tip: If you accidentally cut through the chicken, watch the video above for a great tip on how to fix that! 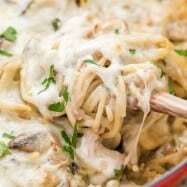 **If chicken browns too quickly, reduce heat. Nutrition Values Note: It is difficult to calculate true nutritional values on foods fried in oil so fat content may vary from what is shown in nutrition label. Q: Have you experimented with stuffed chicken? 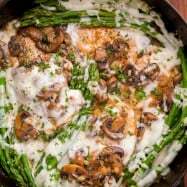 If you have any other creative stuffed chicken recipe ideas, let me know in a comment below. I would love to hear from you! You’re welcome Michelle! I’m glad you enjoy the recipe. Thanks for sharing your fantastic review!